In a state where five gangs vie for control, a city where the streets are no longer safe, the chief of police needs results fast and one cop must make sure that the fight against crime takes a leap forward as you take the role of the star member of the special police respond unit called the Pursuit Force, whose job it is to stop the out of control gangs from continuing to rule the streets. In the pursuit of justice you'll find yourself chasing down the gang members across massive highways, diving from car to car taking them out one by one at blistering speeds. 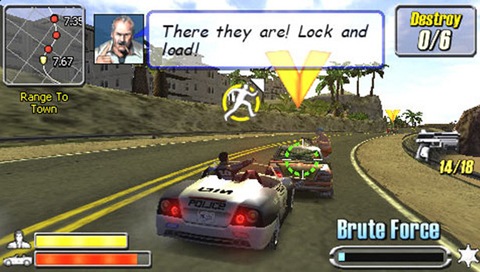 Most missions will start with you behind the wheel of a police car, as you must first catch up with these speed freaks. Then when you catch up to them you'll need to either try and destroy their car by shooting at it or leap onto their car, then taking them down one by one with your gun and duck off the back of the car to dodge incoming bullets, meanwhile trying not to fall off the side of their car as you hurtle round corners at high speeds. Once you shoot the driver, then you can dive in through the window and take control of the car. But it won't only be other cars you'll be diving onto, as you find yourself jumping onto motorbikes and throwing the driver off, and even leaping onto boats and helicopters in pursuit of the crooks. You won't be in and on cars all the time though, as sometimes you'll need to go it on foot running around dockyards fighting and arresting the criminals before they make their escape. 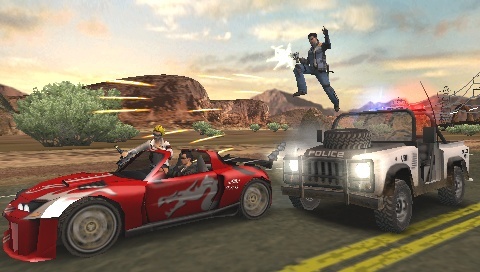 The gameplay is very fluid and once you get the hang of jumping to and from different vehicles and fighting on the roof of cars, it becomes very rewarding and starts to look extremely cool, special when you start to make use of the justice bar which, when full, means you can dive from vehicle to vehicle in slow motion, which also gives you an opportunity to get a few rounds off on the bad guys. There is plenty of variety to each mission as you progress through the career mode, as some missions will for instance require you to take a passenger to a target location, which means you won't be able to leave the car you're driving and will have to shoot out the car's window to keep the gang members at bay. Other missions will see you only jumping from boat to boat up river sections, or only operating a gatling gun mounted on a police helicopter, which helps break up the action to stop it from becoming repetitive. The difficulty can be at times challenging as you progress, but as you learn to use the justice bar effectively, the increased weapon damage and faster health regeneration will help you through tough missions. Altogether Pursuit Force is a beautiful and well put together game with enough things to do to keep you busy, so if car chases, guns and action sounds like your thing, then make sure you check out Pursuit Force.